Features 5x digital zoom and advanced backside illumination sensor for brighter, clearer low-light photos. New front-facing camera makes it easy to take self-portraits. 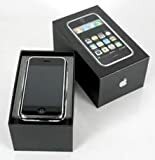 The Apple iphone 3G 8GB - Unlocked is the second generation Apple device designed to work anywhere in the world. Just pop in your sim card and go. This phone uses fast 3G technology and provides lightening data speeds. The phone cannot be updated or restored or you may lose your unlocked status. While everyone else was busy trying to keep up with iPhone, Apple were busy creating amazing new features that make iPhone more powerful, easier to use, and more indispensable than ever. The result is iPhone 4. The biggest thing to happen to iPhone since iPhone. All the breakthrough technology in iPhone 4 is situated between two glossy panels of aluminosilicate glass - the same type of glass used in the windshields of helicopters and high-speed trains. Chemically strengthened to be 20 times stiffer and 30 times harder than plastic, the glass is ultradurable and more scratch resistant than ever. It's also recyclable. The 960-by-640 backlit LCD display boasts a pixel density of 326 pixels per inch, making it the highest-resolution phone screen ever. To achieve this, Apple engineers developed pixels so small - a mere 78 micrometers across - that the human eye can't distinguish individual pixels. That makes text remarkably sharp and graphics incredibly vivid. IPS technology also provides excellent color and contrast from almost any viewing angle. Created from Apple's own alloy, then forged to be five times stronger than standard steel, the CNC-machined band is the mounting point for all the components of iPhone 4. The band provides impressive structural rigidity and allows for its incredibly thin, refined design. It also functions as both iPhone 4 antennas. Apple engineers designed the A4 chip to be a remarkably powerful yet remarkably power-efficient mobile processor. With it, iPhone 4 can easily perform complex jobs such as multitasking, editing video, and placing FaceTime calls. All while maximizing battery life. iPhone 4 includes a built-in three-axis gyroscope. When paired with the accelerometer, it makes iPhone 4 capable of advanced motion sensing such as user acceleration, full 3D attitude, and rotation rate. Translation: More motion gestures and greater precision for an even better gaming experience.